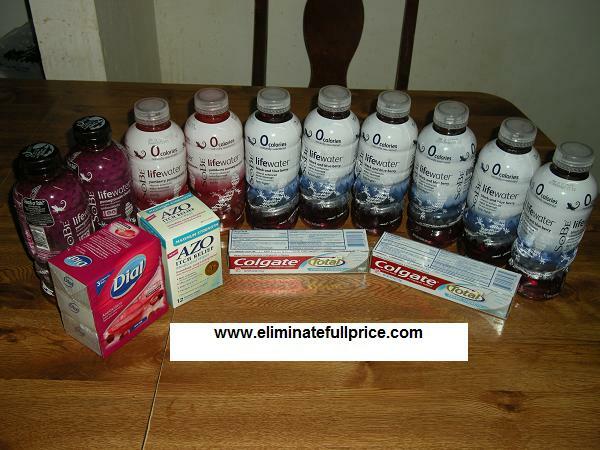 Eliminate Full Price: Super Sunday Savings @ CVS - How I spent $2.37 on $31.84 worth of items! Super Sunday Savings @ CVS - How I spent $2.37 on $31.84 worth of items! I had a great transaction at CVS on Sunday. I was able to eliminate full price on $31.84 worth of items. My total out of pocket expense was $2.37. After I gave the coupons to the cashier my total was $2.37! $31.84 pre-coupon total - $2.37 post-coupon total = $29.47 savings! In addition to my savings, I was able to get $5.98 Extra Care Bucks from getting 2 Crest Total Toothpastes, $5 Extra Care Bucks from the AZO wipes, $5 Extra Care Bucks from buying $15 worth of Sobe, and $1 Extra Care Buck from the Dial Soap. I received a total of $16.98 in Extra Care Bucks to use on a future transaction.